What do I Love Lucy, donuts, wetsuits, and all-inclusive vacations have in common? These concepts all date back to the 1950s. Though the 1950s saw no Silicon Valley or hi-tech startups, traditional startups were alive and well. Below are a few of the many startups from the 1950s still delighting us to this day. Club Med, which now has 71 luxury resorts around the world, started in 1950. The first Club Med village was located on the Spanish island of Mallorca. Though this first "resort" consisted of unlit straw huts, the company's founders pioneered the all-inclusive concept. 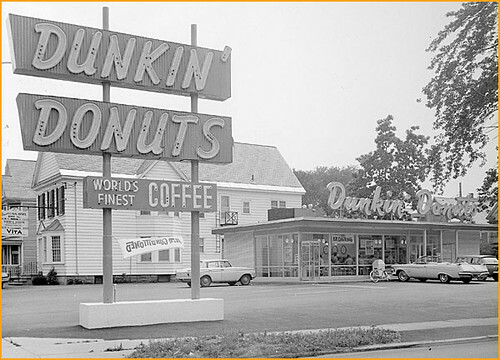 The first Dunkin' Donuts shop opened in Quincy, Massachusetts in 1950. Within five years, the first franchise had opened. Fast-forward six decades into the future and today's Dunkin' Donuts serves over 3 million customers per day. Desi Arnaz and Lucille Ball founded Desilu Productions in 1950 with the goal of converting the couple's vaudeville act into a television series. The goal was reached, I Love Lucy was born, and the rest is television history. In addition to producing the beloved hit show I Love Lucy, Desilu Productions also produced Star Trek and The Untouchables. Founded in 1952 by two brothers from Idaho, Ore-Ida gets its name from the two states of its birth: Oregon and Idaho. The brothers built a potato processing plant in Oregon near the Oregon-Idaho border. Ore-Ida was eventually acquired by the H.J. Heinz Company. Another company founded by entrepreneurial brothers, Body Glove got its start in 1953. The Meistrell twins, Robert and Bill, had developed the first practical wetsuit and named it the "Thermocline," a name that never really caught on. Billy described the suit as fitting "like a glove" and the name Body Glove stuck. Sport Chalet was founded in 1959 after its founder stumbled upon a quaint little ski shop in the Southern California community of La Cañada. Yes, there is skiing in Southern California. Also nearby is the Pacific Ocean. After learning about SCUBA, Sport Chalet's owner added SCUBA equipment to its inventory followed by rock climbing and backpacking equipment. Though these sports were obscure at the time, Sport Chalet had found its mark. Today, you can still enjoy the fruits of these startups' labors. Most of these startups from the 1950s continue to operate. They've managed to remain true to their founders vision yet evolve with the times.